Tire Technology Expo beats all expectations! Tire Technology Expo and Conference continues to set records with each passing year, with the 2019 event welcoming more exhibitors, delegates, speakers and attendees than ever before. Leading experts in tire design, development and manufacturing headed to the Hannover Messe in Germany to discuss the topics and themes dominating the industry. With 319 exhibitors spread across three halls, and some 550 conference and workshop delegates enjoying presentations from 180 speakers across 12 separate streams, the 2019 Expo and Conference welcomed more than 5,600 visitors through the doors during the three days, cementing the expo’s place as the must-attend event for those working in the tire industry. The world’s largest gathering of tire design, development and manufacturing experts was officially opened by Expo founder Tony Robinson, the chairman and CEO of UKi Media & Events, which organises the event. A packed conference schedule welcomed speakers from across the tire industry, and covered an expansive range of topics pertinent to those working in the business. Across the three days, leading experts discussed everything from the role of the tire in future transport solutions, tire testing, material advances and improving manufacturing, to rubber compounding, modelling techniques, sustainability developments, tire recycling, polymer science, business models and advances in pneumatic tire performance. On the exhibition floor, product announcements included Cassioli’s new automated handling systems, Albeniz’s AST 4.0 labelling technology, and Zeppelin’s cloud-based mixing platform. For these companies, Tire Expo’s expert visitor base made the event the perfect place to introduce new technologies and innovations to an audience able to see the full potential of the latest advances. 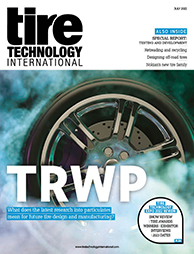 Tire Technology Expo also showcased its ability to connect leading players across the industry, with Uzer Makina revealing details of collaborative projects with partners such as FineLine and Romill – more on these advances in the March 2019 issue of Tire Technology International magazine. At the end of Day 2, attendees enjoyed the presentation of the 2019 Tire Technology International Awards for Innovation and Excellence at a spectacular gala dinner. Winners included Michelin (Tire Manufacturer of the Year) and Bridgestone, which took home the Environmental Achievement award for its development of High-Strength Rubber. SRI claimed the Tire Technology of the Year trophy for Sensing Core, HF Group picked up the Tire Manufacturing Innovation of the Year for One TBM, and Test World was awarded Supplier of the Year. Furthermore, the gala dinner saw Chidambaram Subramanian presented with the Young Scientist Award, and Rudi Hein honoured with the Lifetime Achievement Award. Tire Technology Expo is the perfect opportunity to debut products and technologies, and this year saw Cassioli introduce a new range of fully automated handling solutions for manufacturing and distribution. Designed to optimise material flow and increase product quality thanks to efficient logistics and traceability, the new range offers customers high levels of flexibility. The diversity of production lines within the tire industry also means Cassioli’s experts must be adaptable. At the 2019 Expo, Kraton is highlighting its new range of Sylvatraxx modified terpenes, which have a higher softening point with low polarity and low molecular weight. Nicolas Derville, business director for tires, says, "This gives better compatibility with the compound matrix and an improved performance ratio compared to existing solutions such as hydrocarbon resins. This enables a wider formulation range, due to the better compatibility and lower weight." Ultimately, the new product line will help customers to develop tires with greater wet grip, lower rolling resistance and better durability. As part of its ongoing innovation efforts, Kraton recently expanded its technical team in Asia and is adding positions at its lab in the Netherlands. Since expanding capacity for its Sylvatraxx range last year at its facility in Niort, France, the company also announced its plans for further expansion. "We have been thrilled with customer response and we are currently identifying options for additional capacity increases, which will be implemented as the market demands," Derville comments. Industry 4.0 is a topic of conversation that continues to dominate the tire business – and it is being discussed throughout the exhibition halls. For Emerson, which was making its Tire Technology Expo debut in 2019, the show was an opportunity to showcase the company’s wide range of competencies. As tire makers strive to achieve greater efficiency in production, coupled with better performing products, the need for innovation in materials becomes more important. As a result, Momentive Performance Materials has seen a rapid increase in demand for its NXT Z 24 silane, which offers a virtually ethanol emissions-free option for enhanced tire performance. David Degville, global business unit leader for tires, explains, "We are hoping to gain exposure for our coupling agent line for silica-reinforced tread compounds, which offers performance and processing benefits, at Tire Technology Expo this year." Last year the company expanded its capacity in Europe with a new production plant in Leverkusen, Germany, and has announced its aim to establish an additional facility in Asia in the near future. "The show's also an opportunity for us to build customer relations and we welcome any insights that people can give that will help us better understand the demands of the industry," Degville adds. Momentive's Dr Daria Sitnikova, application development engineer, will be discussing how to use the NXT Z 45 silane efficiently in the plant when manufacturing high-performance tire compounds on Day 2 of the Tire Technology Expo Conference at 16:10, Stream 10 - The Changing Role of Polymer Science in Tire Performance Improvements. Festo is demonstrating how its groundbreaking Motion Terminal is bringing pneumatic machinery into the era of Industry 4.0 through digital apps that can replace up to 50 individual components. Existing pneumatic machines can be digitised to speed up processes, decrease energy consumption and improve efficiency. Installed in a tire press, for example, the technology has the potential to save 2.7 production days per press. Before a green tire is produced in the tire-building machine, the incoming rubber plies are imprinted with different patterns to prepare the tire material perfectly. Small pneumatic cylinders apply the different patterns to the rubber layers via cams. These must be controlled very precisely in a pressure range of 0.05 to 8 bar. Previously, a proportional valve was used for each individual pressure zone in this application. This design required a lot of installation space and a complex controller. The process is now simpler and less expensive thanks to the VTEM automation platform, because instead of individual proportional valves, the Festo Motion Terminal requires half as many valve slices. With the Festo Motion Terminal, 16 independent pressure zones can be set up. Applied in a tire curing press, the automation platform enables numerous benefits including synchronised movement of the left and right handling and smoother movement with reduced vibrations in the press. It also enables more targeted maintenance and diagnostics. “In the future we could marry the product with artificial intelligence so that the system learns by itself. For example, if the vibration is becoming too high, the system would sense this and make the necessary adjustments to reduce the vibration, while operating at maximum speed and performance. This feedback could then indicate if a mechanical part needs adjusting or changing,” Hering explains. For advanced dispensing system expert Lawer, exhibiting at Tire Technology Expo is about more than simply showing off a product on a stand – the targeted and expert visitors to the Hannover Messe are able to discuss and understand the company’s modular dosing equipment and, just as importantly, learn more about its potential applications. On the Lawer stand is an example of equipment to pre-weigh the chemical ingredients in mixing production. The modular machine is able to produce two bags per minute – in different sizes, according to the quantities in the recipe. The combination of the equipment is flexible according to the customer’s needs and the packaging in which that customer buys the chemicals. The experts attending Tire Technology Expo are able to not only appreciate what’s on the stand, but understand the potential of working with Lawer to develop a solution that is customised to their needs. Another debut at Tire Technology Expo 2019 is Albeniz’s AST 4.0 high-yield,multi-format tire labelling machine. The new machine can support four different labels simultaneously, making it possible to offer non-stop operation. After passing through a scanning gate, the information is read from a specific tire, and transferred to the label machine, which applies the adhesive label to the tire. The application height is fully adjustable, making it possible to work around different tire types, constructions and dimensions. “Our advantage is that we can operate non-stop,” explains tire market product development director Joseba Albisu. “We can store four different types of labels that are fed into the machine – these can be for two different types, four different types, whatever the customer wants. And they can be changed while the machine is in operation. This is our key advantage. Bartell Machinery Systems is demonstrating its revolutionary system concept for full in-line automated inspection of tire beads. In an industry first, the company has developed a technology to replace traditional manual off-line systems – which use either vision inspection or manual contact measurement – and achieve 100% inspection of beads. Key benefits of the system are greater visibility into the quality of products, elimination of user variability, improved efficiency in inspection and tighter control in maintenance. If quality conditions change over the batch run, the machine operator can adjust the machine parameters, for example. With integrated data recording and collection, companies can track their products and, if necessary, take action to either refine the equipment making the components or improve the efficiency of the process. Feedback from visitors has been extremely positive. The company has discussed applications for potential new projects as well as retrofits. The advantages of automation have also been realised in Bartell’s new single-wire bead winding machine. This advanced system combines a series of improvements made over several years, and bundles them together to achieve a productivity increase of over 10%, advanced automated process control and reduced maintenance. Generally, the system’s components have been developed to be more durable, and the frequency of maintenance cycles has been cut to enable more uptime. Each section of the process line has been improved, from the let-off stand to the Festoon accumulator, through to enhancements in the winder itself. LMI’s stand features demonstrations for sidewall scanning, a dual sensor setup calibrated onto a single-coordinate system, and a high-speed scanning application. The last of these is of particular interest to visitors, as it features LMI’s latest product – the Gocator 25 Series.